The IS PLUS Corporation held the ceremony for the 48th 백상예술대상 (PaekSang or BaekSang Arts Awards) tonight at the Seoul Olympic Stadium. The historically-based crime drama 범죄와의전쟁 (Nameless Gangster) by 윤종빈 (Yun Jong-Bin) claimed the Grand Prize. It also won Best Rookie Actor for 김성균 (Kim Sung-Kyun). It had led with six nominations. Another true crime story 부러진화살 (Unbowed) by 정지영 (Chung Ji-Young) was the only other film to win more than one award. It took trophies for Best Picture and Best Actor for 안성기 (Ahn Sung-Ki). Otherwise, the awards were spread around. 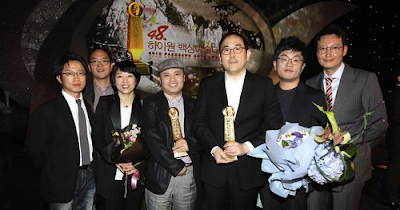 Best Director went to 변영주 (Byun Young-Joo) for 화차 (Helpless), while Debut Director was presented to 임찬익 (Lim Chan-Ik) for 체포왕 (Officer of the Year). 엄정화 (Uhm Jung-Hwa) won Best Actress for her title role on 댄싱퀸 (Dancing Queen). The Rookie Actor and Actress prizes were given respectively to 김성균 (Kim Sung-Kyun) for 범죄와의전쟁 (Nameless Gangster) and 수지 (Bae Suzy) for 건축학개론 (Architecture 101). The Popular Actor and Actress prizes went to 장근석 (Jang Keun-Suk) for 너는 펫 (You're My Pet) and 강소라 (Kang So-Ra) for 써니 (Sunny). For television, 뿌리깊은 나무 (Tree With Deep Roots) claimed the Grand Prize and also won for TV Screenplay. Other shows that were double-winners were 해를 품은 달 (The Moon That Embraces the Sun), 오작교 형제들 (Ojakgyo Family) and 개그콘서트 (Gag Concert).